The Paradise Shelduck, Tadorna variegata, is a large goose-like duck endemic to New Zealand. They are known to the M? 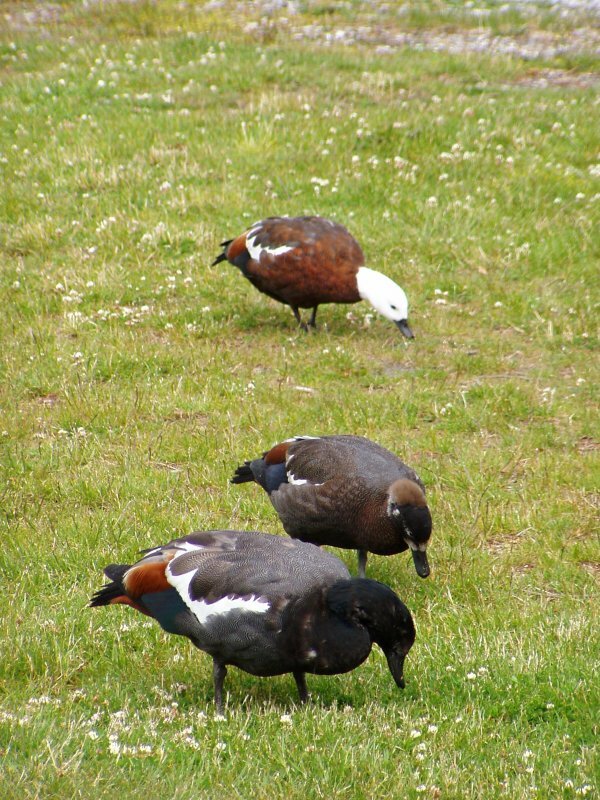 ?ori as Putangitangi but now commonly referred to as the "Paradise duck", and are prized game birds. Both the male and female have striking plumage, the male has a black head and barred black body, the female a white head with a chestnut body. The Paradise Shelducks are usually live as pairs, grazing on grass and weeds, and will raid crops, particularly when molting. Paradise Shelducks form long-term pair bonds, often lasting for life. They reach sexual maturity after two years, and build nests hidden in high grass or beneath rotting logs, and is lined with grass and feathers. Chicks fledge after eight weeks. Paradise Shelducks were uncommon prior to European settlement, however changes to habitat caused by the conversion of forest to pasture, and the deliberate provisioning on ponds by hunting groups, has lead to a large increase in the numbers of these ducks.